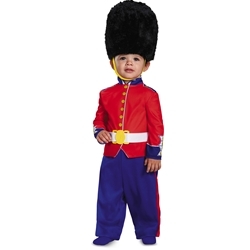 The British Guard Toddler Costume includes red top with printed on buttons, blue pants, and bearskin style hat. The Queen’s Guard is one of the most iconic troops in the world. They are identifiable by their signature red outfit with tall black bearskin hat. While often perceived as being only ceremonial, the Guard are actually fully operational soldiers. Have your toddler defend the Queen this Halloween as a British Guard!